I used to have this somewhat mad idea that do ahead cookie dough was some special type of dough. I've long since discovered that you can do-ahead ANY sort of cookie dough and choose to either roll into little logs and slice the rounds, roll into balls, freeze on parchment (baking paper), then tip into freezer bags to transfer to trays for baking, or just keep a lump of dough in the fridge to carve bits off and bake as the mood takes you. Of course going Gluten Free put paid to any cookie eating in this household for a while, because I became secondarily convinced that gluten free baking was mysterious as well. All that talk of Xanthum gum and Gluten subsitute just made me nervous. Once again, common sense prevailed. Flour is basically flour, no matter the origin. Some may lend a different flavour to your baking, but they're all good. The exception to my baking rule is of course things like bread and sponge cakes, which I refuse to even put to the test, but that day will come. I've since made these little cookies with rice flour, cornflour, sorghum flour, teff flour, tapioca flour (arrowroot) and found that they all work well. A combination of at least two different flours and the inclusion of either almond flour (almond meal) or dessicated coconut, adds a bit of crunch and texture. I understand that elevation above sea level can make a difference to the success of some Gluten Free baked goodies so do a bit of a Google search if you're in doubt. Here in the 'burbs in Sunny Queensland, it doesn't seem to matter. I first made these cookies upon seeing the Lemon Olive Oil cookies in the book, Gluten Free Girl. I liked her recipe, but found it a bit pedantic on the use of the specified flours, sour cream (I note she has changed this on her blog to yoghurt which is what I used anyway) and lemon infused olive oil, which here in Australia costs a blinkin' fortune...sorry Shauna! So as is my way...never could leave a good thing alone...I fiddled with it and came up with a pretty good version...nay, an excellent version, flavoursome, less expensive to create, and bursting with little nuances unique to a good cookie. Clearly you can make these with normal flour too. Mix the flour/s, almond meal or coconut and baking powder together. In a medium to large bowl, mix the sugar (keep the extra sugar aside in a sealed container for later when you want to roll and bake your cookies) olive oil, egg, yoghurt and orange juice. Combine until it's nice and smooth. Mentally divide your dry ingredients into four equal parts, and add the dry to your wet ingredients one quarter at a time. Add the orange zest and craisins last. Plop the dough onto a big piece of cling wrap, form into a ball, and wrap firmly. Refrigerate overnight. The texture of the finished cookies will improve with resting the dough. When you're ready to bake, get out your ball of dough and your sealed container (I use a smallish lunchbox with a lid) with the sugar in it. Caster sugar is best but it doesn't matter too much. Preheat the oven to 180C fan forced. Use a teaspoon to 'cut' even sized knobs of dough from the larger piece and roll into small balls. Place in the sugar, and as the lunch box fills, top with the lid and gently roll and shake around to coat them in sugar. Place on trays. These don't spread too much so you can sit them quite closely together. Bake for 20-30 minutes, until just turning golden brown. These are somewhere between a crisp biscuit and a cake, so the texture is a little different, but definitely more-ish. 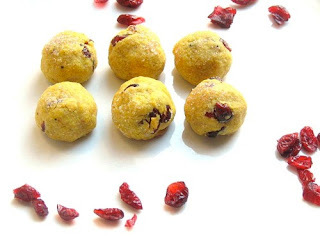 They are also lovely with lemon juice and zest and dates, lime juice and zest and currants and any other combination of citrus zest and dried fruit. Last weekend, I made some with lime zest, dried crystallised ginger chopped tiny and a grating of pepper. Yes pepper. My husband went wild for them. Just goes to show, never be afraid to experiment! I'm always highly amused when friends go looking for a 'certain' cookie recipe...like choc chip and raisin..well, gee if you have a recipe you like, just change the flavours and add-ins...nothing scary will happen and the cooking world will not tilt on it's axis. I baked a batch of these last night. Yummo!!! Quite a distinctive texture - they reminded me of a rock cake that I had at the souvenir shop at Stonehenge, UK. So not only are they delicious, they take me back to a wonderful time in my life -a big thank you!! Thankyou Helen. I'm so pleased you liked them. Food is a powerful memory trigger, isn't it?